I was asked to make a set of three items for some siblings. They are younger kids and just got a new baby sister. We wanted to make them all something that kind of coordinate together, so we picked out two variegated colors one each for the older two kids, a boy and girl set of twins. These colors would be made into two scarves for them. For the girl scarf I used this One Skein Scarf pattern. The yarn is Red Heart in Pink Camo. Instead of 201 chains I did 124+3 to turn to make it a more appropriate length. This came out to about 48 inches long and 5 inches wide. It's thinner and pretty stretchy so I feel it could be wrapped nicely. It came out really cute I think. I finished this one in the airport and got a very nice compliment on it. I'd say this took about 2 hours to make. For the boy scarf I based it off this Simple Scarf except that I made mine 15 double crochet across since it is for a smaller kid. I used a skein of I Love This Yarn in Peacock Ombre. Since the ribbed area is a bit denser than the body of the scarf, the center is decreased to 13dc across until the other end where it widens back up to 15 for the other end's ribbing. This scarf is about 48 inches long and 6 inches wide. Since it was a little thicker, I'd say this one took about 3.5 hours. For the youngest girl we wanted to make a baby blanket for her. I needed to have enough yarn left over from each of the siblings skein to get around the blanket for edging, hence the smaller scarves. We bought 4 skeins of Sincerely by Purl Essence baby yarn in Pastel Pink. I used the Simply Square blanket pattern by Lion Brand, and when done did two rows of edging, one in each of the variegated yarns. The pink blanket without the edging measures 44" on each side which is pretty big. Attach new color in first dc of a corner after the chain space, ch1, sc in first dc, sc in next two dc, *chain 3, skip next 3dc, sc in next three*, across. This should line up with 3dc granny square clusters evenly. At the end of the first row you will end with a chain 3, do 3 sc in the ch 1 space in the corner, chain 3 and skip first 3 dc of second side. Continue down the second side with *3 sc, chain 3, skip 3dc*. At the end of the second side you will end in three sc, chain three over the corner chain 1 space and do three sc in other 3dc of corner. At the end of the last side you will do three sc in the last three and be right where you started, don't forget to chain the last three and join to the first sc where you started so you can make a shell on the corner. The next row around makes the shells. Slip stitch into the center of the three sc's then *do 5 dc in the chain 3 space, skip one sc and slst in the center of the next set of 3 sc*, continue around. I barely had enough yarn for this row, so be careful if using leftover skeins for a contrasting border. The opposite corners will be the same, either two shells on the corner or one at the corner, but there are two different corners from your setup in the first row. After I bound off the boy color, I attached the second girl color to the second dc of a corner shell. This first row will again be a foundation for the shells to come in the second round. So do the same as before: *3 sc in the top of the three center dc of your 5dc shells, chain 3, sc in second dc of next shell and do 2 more sc* to complete the three in the top of the next shell. Continue around. Once you reach where you started, you will make the shells as before as well. 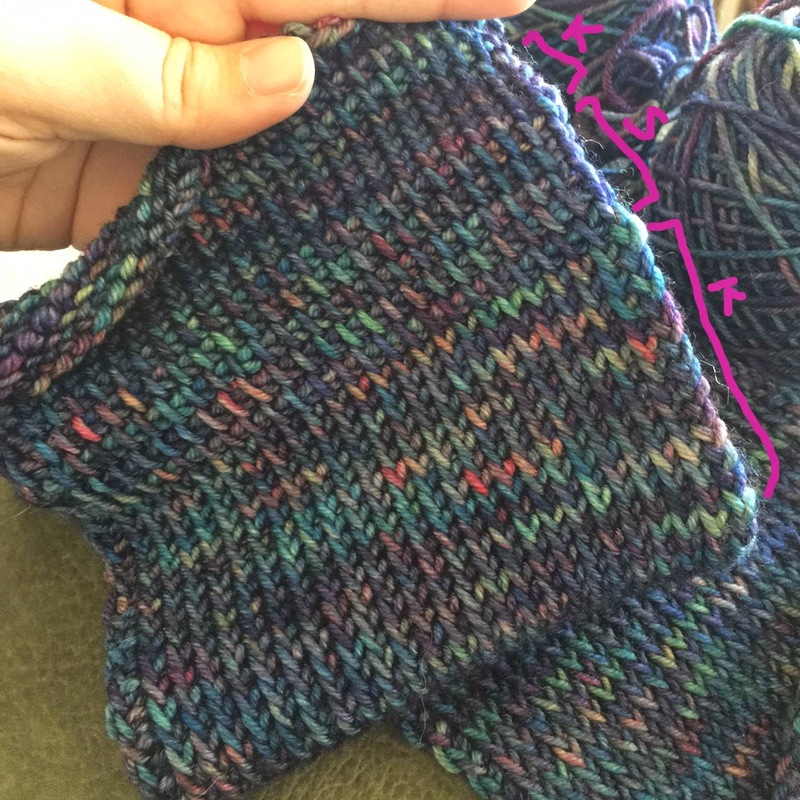 Slip stitch in the center of the three sc. Since this was the outside row and I had a lot more leftover yarn I made larger shells in this second row. I did 7 dc in each chain 3 space. Two corners after second color edging is on. The finished blanket is nice and soft, with a great pop of color and a very usable size for a long time to come. Time to complete is roughly 25 hours as I'd say I worked on it about 4 hours for at 6 evenings. This would be a great beginner blanket since the pattern is so simple, but looks complex and cool. Hope they enjoy the warmth! With almost 125 yards of the Madeline Tosh DK Twist in Mandala left over from my Pineapple Shawl I knew I had enough to make something else. I looked around and found the pattern for Christmas Crochet Mitts by Adriana Veleda. Again this is a great free pattern found on Ravelry or on her blog. I made a few small changes to how I made these starting with the beginning. I started these off with a foundation half double crochet. I like how finished it makes the starting edge of gloves. I was using a 4.25mm G hook for this project and with my yarn I do feel like these came out just a little too big on me. I probably could have made it smaller, but I liked the way it felt on. That could probably be remedied by using a smaller hook. I did 5 rows of hdc after my foundation row and then started on the shell patterning. The technique for the shells is something I am very familiar with from the many fish hats I made back in 2012. I do like her idea of using multiple leftover colors, but I also love how these look and I feel like they will be perfect to wear on those days I use my shawl as a scarf. They have a nice stretch to them and should fit just about anyone. Time to complete: 2 hours for the pair. I mentioned last week that I ripped out my tunisian cowl that I had been working on. I did this for several reasons, but the main reason was that with such a compact fabric I was losing a lot of the beautiful variegated colors of the Mandala Tosh DK to the inside of the stitches or where it would not be seen. I wanted to do something pretty, and the pattern could not be a subtle one, or it would not show through the color changes. I really like the look of intricate leaf pattern knit shawls, but crochet seems to have no patterns for things like that. The closest I could think to come up with would be a doily type lace shawl so I set about finding a pattern for it. I've worked a pineapple doily before so when I saw the Pineapple Doily Shawl by Laura Garsten on Ravelry, I knew I could make it with no problems. When I saw how it looked on a person I loved that the large pineapples made it look kind of like large hanging feathers. Pretty. Bonus: The pattern is free! I knew though that I would most likely need a third skein of this yarn to complete the pattern... but that's ok. I figured I could get as far as I could and if I liked it, then I could get the third skein and complete it. If not, well I could rip out another project... Fancy yarn = I better love it. I got to row 6 which I knew from reading other project notes had a small error in it. You need to have the repeat include the skipping 2 stitches or the foundation for your pineapples wont be spaced out properly. The row is also a bit confusing to read and I feel like this could be achieved easier if she had used the "sh" and "SH" terms she defined at the beginning of the pattern to write the instructions out. Row 6 is the outside edge. Points are at the SH, sh is the center between to points. We know sh is a small shell, or V stitch as I've seen in the past: a dc, chain 1, dc in the same stitch. The SH is a large shell, or bulked up V stitch: two dc in one, chain 2, two dc in the next. In between each shell you do a chain one and skip two dc. repeat from * to * across ending on a SH. This will make the foundations for your next row of shells. That seems less confusing to me anyway. Moving on. By Row 11 I was out of my first ball of yarn. In the picture below, you can also see something weird happening on the edges of my shawl. They are getting little nobbies at the end of each row. That's because I was doing something wrong; namely that instead of slip stitching into the first dc in each row, I went into the second and then into the first space. I did that wrong without knowing for the first couple of rows, then decided I liked the way it looked and kept doing it rather than going back and ripping it out. Happy accidents in crochet aside... I got all the way to row 17 and was out of my second skein of yarn. Bummer since I only had the two, so I went down to MadTosh Crafts in the hope that they would still have the yarn in stock. Unfortunately they did not have the ToshDK in my color, but they did have the color in ToshDK Twist... since there was very little difference visibly that I could tell I got two skeins so that I could complete this project. I got back home and back into the groove when I realized something... One pineapple was smaller than the rest. Turns out way back on row 10, instead of 13 treble crochets, I had done 11, and just on this one pineapple. I knew it would make the whole thing hang oddly and bother me to no end, so I had to rip it all out down to that base. So note to people: Make sure you count obsessively on row 10 to make sure you don't mess up like I did. Restarting from row 10 back up to about row 15 took somewhere in the neighborhood of 3 hours. So you can see that this piece can be made pretty fast, if you do it right the first time. On Row 22 I decided to make a change. By this row you have finished the small pineapples and the pattern creates a large chain space hole at the tip of the pineapple. I didn't like that so instead of chaining three over the top of it, I chained one, treble crocheted into that tip chain space, chained one again and then moved on with the pattern. That meant that I added another bar from the tip and I think it helped to pull the pineapple into shape as well as prevent a large hole space. Changed Row 22: slst in first dc, slst into ch2 sp, ch3. (dc, ch2, 2dc) in ch2 space. *ch3, sc in each ch1 sp across 12 times, ch3, Sh in next Sh, ch1, tr crochet into chain 3 space of tip of pineapple, ch 1, Sh in next Sh* repeat from * to * across. Turn. I circled the added treble crochet, without it this is a large hole here. Once that last row is done, you work each larger pineapple individually. You can do the first one without cutting your yarn though. It's pretty easy to work and you get all the way to the end tip of the pineapple with the notation for rows 23-32 and I did not bother to count my rows since you are done when you have no more chain 3 sc decreases to make. The last rows 33-35 make the end look nice. I got two of the large pineapples done with my third skein and still had 8 large pineapples to go with the last skein, which I figured would be more than enough. The pattern calls for about 840 yards to make this. Total yardage I used: 2 skeins Tosh DK at 255 yards and 2 skeins Tosh DK Twist at 250 yards for a total of 1,010, so of course I had about 125 yards left over. Love the petal like pattern shapes. Close up of one of those fantastic pineapples. Time to complete: 12 hours without mess ups, for me more like 16 hours. As we have previously established, the waistcoat stitch is an excellent way to replicate the look of knitting with a crochet hook, but creates a superdense, non-stretching material that tends to be very stiff. It's pretty cool for gloves and hats, but is not a good option for anything that needs to be made in flat pieces, like say, clothes or scarves. Tunisian Crochet Cowl by Rescued Paw. To be honest, I am still confused as to why this Clover hook has two ends... I have read somewhere, I thought, that it is to make tunisian in the round with, but I cannot figure how. Leaving that aside, this hook is almost too short to make this cowl pattern with. The number of stitches just barely fits and I have trouble keeping it scrunched up to fit, while working. I am considering ordering a set of hooks online, the longer 12" ones with little nobs on the end to stop your work escaping. I feel like these would be a good investment if I decided to really try to make a full sweater from this technique. In any case, I managed to work several rows of this technique with this hook mainly because I watched this How To video by Happy Berry Crochet. I guess I had assumed that tunisian was a single kind of stitch and that it made knit look stitches. Wrong. The simple tunisian stitch does not look anything like knit, that is in fact another stitch... called the knit tunisian stitch. Luckily, the video does a great job of explaining both and how they are different, which is to say, not very. In any case, I decided to make the cowl in some super pretty Madeline Tosh DK in Mandala. It is just a little stretchy which helps a lot with making this stitch. I used the color changing technique by Rescued Paw to alternate between two skeins of the same color, to break up the color patterning that I feel tends to happen with variegated yarns. However, since I wanted to practice the knit look, I used the knit stitch, instead of the simple tunisian stitch as her pattern called for. After about 8 inches of work, I was really getting annoyed with the double ended hook. The other end kept biting into the outside of my palm as I worked. So I just went to the store and got a new longer hook. With that I was able to work with less pain and less scrunching. At this point I was pretty bored with the knit stitch and felt comfortable with it. Even though this colorway is amazingly pretty, I felt I might be doing a disservice to it with such a plain application. So once I figured I had about half done, I decided to work in five row chunks, alternating between knit and simple stitch, to get a kind of striped texture that might be more visually interesting. K for Knit tunisian stitch, S for simple tunisian stitch. But hard to tell right? I did a few "stripes" of the texture/stitch switching, but the variegated color made it pretty hard to see. This piece was also doing some massive amount of curling. Obviously it would need to be blocked before it could even be remotely wearable. I found out that I was working way too tightly which caused the curl. I started this cowl in December, but stopped working on it and did a lot of orders for people in the mean time. Like I said I was bored and new orders were more fun to do. By the time I got a lull in orders again, I had put this project down so long that I was hesitant to pick it up again. So, I ripped it out and decided to use the two skeins of yarn for something prettier than a cowl. Getting that far into the cowl, I now understand how to do these stitches at least. The fabric created by the knit stitch is really dense, but seems to have good stretch to it. The simple stitch creates a slightly thinner fabric that might hang better on the body but doesn't have that knit look. I do think both would make a good sweater, as is my goal, but this project has served it's purpose. Difficulty learning Tunisian: Not hard at all if you know basic crochet.